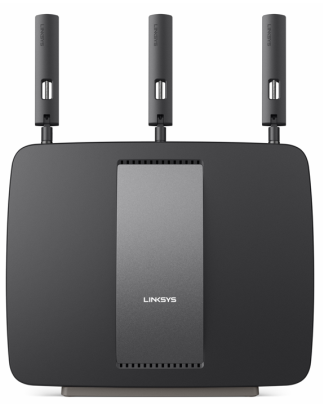 The Linksys AC3200 Tri-Band Smart Wi-Fi Router, EA9200 is a Linksys Smart Wi-Fi Router with Tri-band technology which adds an additional high-speed 5 GHz radio to combine speeds of up to 3.2 Gbps and doubles the performance of a dual-band router. 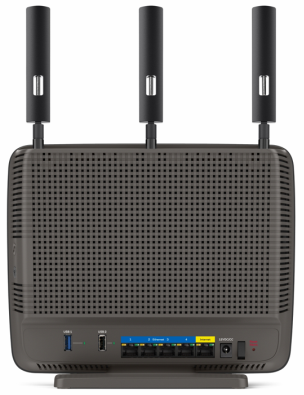 It has a Smart Connect feature that optimizes the performance of your wireless devices by balancing them across multiple Wi-Fi bands. This router is designed for device-heavy homes with simultaneous wireless activities. NOTE: To know more about Smart Connect or Tri-band technology, click here. Indicator light - The Linksys logo stays steadily ON while power is connected. It flashes or pulses slowly during boot-up, firmware upgrades and during a Wi-Fi Protected Setup™ (WPS) connection. NOTE: A steady indicator light also means that a successful WPS connection is established. The light flashes quickly when there is a WPS error. USB ports - Connect and share a USB drive or a USB printer. USB LEDs - Illuminate when a USB drive is connected while flash when data is being transferred. Ethernet ports - Connect Ethernet cables to wired Ethernet network devices. Internet port - Connect an Ethernet cable to your modem. Power port - Connect the included AC power adapter. Power switch - Press | (ON) to turn ON the router. Reset button - Press and hold for 10 seconds until the port lights flash at the same time to reset the router to factory defaults. You can also do this using your Linksys Smart Wi-Fi Account. 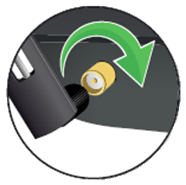 Wi-Fi Protected Setup™ (WPS) button - Press to easily configure wireless security on WPS-enabled network devices. Wi-Fi button - Press to disable the wireless networks (light comes on) then press again to enable the wireless networks (light goes out). This will disable all wireless radios. Adjustable antenna ports - Three (3) adjustable external antennas (included) should be connected to the router before powering it ON. Twist antenna connectors clockwise onto ports.